Series 27 & Series 28 Exam Study Guides—Now Available! 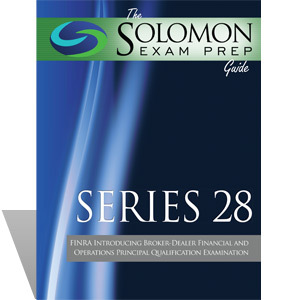 Solomon Exam Prep is pleased to announce the publication of our Exam Study Guides for the FINRA Series 27 Financial and Operations Principal Qualification Examination and FINRA Series 28 Introducing Broker-Dealer Financial and Operations Principal Qualification Examination. An Online Exam Simulator for both exams has been available for the past year, but we are excited to expand our product offerings to better assist our customers in passing these exams. Both Exam Study Guides are available as a hard copy book and can be purchased on the Solomon Exam Prep website. An online, digital version of these Study Guides will be available in the coming weeks. Solomon Exam Prep Exam guides focus on the most important aspects of the exam and are peppered with frequent examples, exercises and practice questions. These succinct Exam Study Guides will get you on track to passing your exam in no time. These new guides are additionally offered as part of our Essentials Study Package and included with our Online Exam Simulator—at a discounted price. Used successfully by thousands, this powerful combination gives you what you need to learn and retain the material by testing yourself as you go. Do Regulation T, rehypothecation and FOCUS reports give you a headache? Do you need to take the FINRA Series 27 exam? If you can answer yes to both questions, then let Solomon Exam Prep help relieve your anxiety. 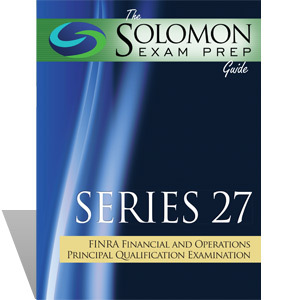 The Solomon Exam Prep Guide to the Series 27 FINRA Financial and Operations Principal Qualification Examination offers an efficient and comprehensive overview of what you need to know to pass the Series 27 exam. Do PAB Accounts, margin requirements and FOCUS reports give you a headache? Do you need to take the FINRA Series 28 exam? If you can answer yes to both questions, then let Solomon Exam Prep help relieve your anxiety. The Solomon Exam Prep Guide to the Series 28 FINRA Introducing Broker-Dealer Financial and Operations Principal Qualification Examination offers an efficient and comprehensive overview of what you need to know to pass the Series 28 exam.